Papergraphics are constantly seeking out the best products for our customers. Products that perform brilliantly, are built to last and are perfect production tools for a specific task. Laminators form an important part of the finishing aspect of printing. Lamination film can be used as protection, enhancement with gloss, matt and textured options and can even turn a simple printed-paper image into a laminated and self-adhesive graphic. Laminators are generally built to last, and there are many, many different types of laminators of varying capabilities in the marketplace. Here at Papergraphics, and after an extensive programme of research and testing, we have chosen to champion and sell the Italian-manufactured FLEXA as our preferred laminator. Throughout our trials and time and time again, it impressed us with its smart engineering and flawless performance. FLEXA have been in business for 25 years and have a solid reputation for designing and supplying innovative and bespoke machines to the print industry. Their laminators are a prime example of their expertise, and we are proud to include FLEXA Formula in our equipment-sales division. The Flexa Formula is an exceptional machine for print experts who work with everything from wide-format graphics and signage to fine art and photography. It's efficient, digitally intuitive, easy to use with a range of smart control features, has a multi-purpose function and overall performs to perfection. 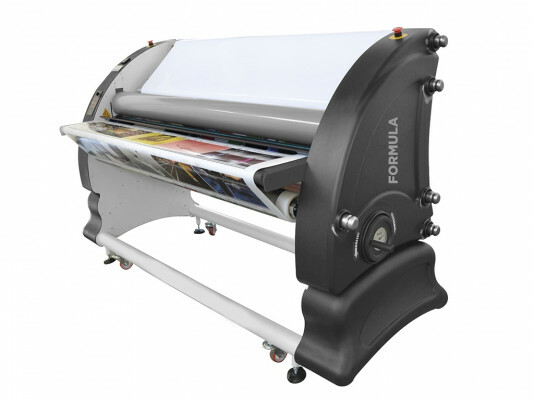 A remarkable feature of the FLEXA Formula laminator is its performance as a five-shaft machine – enabling it to operate as a single-hot or dual laminator that can not only laminate, mount and encapsulate but can also apply double-sided tapes and films to the surface and base of a graphic at the same time. This high-performance laminator also has intuitive set-up parameters on its user-friendly control panel; a heated upper rolled with pre-set options on temperature regulation to mitigate ‘silvering’, an LCD readout to regulate pressure control on the substrate, and 3” aluminium independent shafts for easy roll loading and unloading. You couldn’t ask for more from a professional laminator and, in our opinion, the Flexa Formula laminator represents ‘best in the field’. Our technical team would be happy to guide you through the benefits and features in greater detail or arrange a demonstration so that you can see this exceptional piece of equipment in action. A high-performance laminator, suitable for industrial applications. It allows to laminate, mount and encapsulates prints, applies application tape and double-sided adhesive.